Easy access for fueling LP Tanks. Smooth ball bearing and roller bearing movement. Safety latch mechanism locks slide for safe storage. Tray ships assembled, ready to bolt in, simply insert adjustable center rod to secure tanks. Inside dimension is for tank's measurement. Outside dimension is for compartment fit. 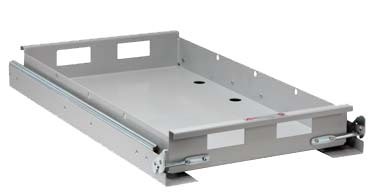 For Propane Trays, measure outside configuration of battery. Select tray with an inside dimension that fits. verify that the outside dimension will fit the compartment. 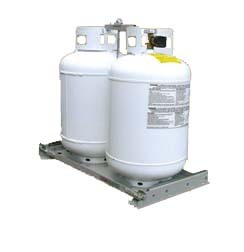 Propane Tank Tray, 24" x 11-3/8"